Remember when I this post from this morning? I bet you pictured me curled up in a quiet chair reading Proverbs 31, drinking my delicious shake while my children (dressed in clothes from Children’s Place) quietly played with those adorable wooden toy made by the Melissa & Doug on the floor nearby. Maybe there were even some quiet hymns playing in the background. And Rowdy was curled up on my lap. You probably pictured me wearing cute & cozy matching top & bottom pajamas with some ironic print like penguins or hairbrushes on them. I bet you thought my hair was adorably disheveled and that I just spent the morning reading and thinking, thinking and reading in my clean and tidy house. Have I gone too far yet? Have your realized that I’m being ridiculous? I just don’t want to be one of those bloggers who takes a nice picture and writes up a nice post and makes it look like her life is not total chaos some of the time. Blogs are fantastic because they give us little snippets of each other’s lives and I wanted to bring you into a more real picture of mine. I’m pretty sure God’s just as okay with me standing over my messy countertops reading His word while my kids run around screaming like banshees. I think sometimes we feel like to get into the Word, everything has to be peaceful and calm. My life is never like that. I fit in time for reflection whenever wherever I can, and shoot up prayers like arrows when I can’t. 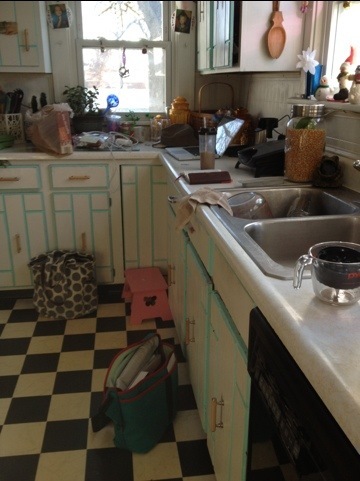 For what it’s worth, PJ, my kitchen looks better now than it did in this picture :).